Below I transcribe a couple newspaper articles from the St. Louis Star and Times mentioning my grandmother, Myrtle Vanevery Deutsch (1900-1951). St. Louis Star and Times, June 26, 1933, p. 6. Miss Florence E. Slatery, 5879 Delor street (left), as national president, today opened the annual convention of the Delta Sigma Sorority at the Coronado Hotel. Above (right), is Mrs. David Campbell, 5927 Kingsbury avenue, national treasurer, and below is Miss Myrtle Van Every, chairman of the committee in charge of a bridge luncheon to be given tomorrow afternoon at the Glen Echo Country Club in honor of visiting delegates. The Delta Sigma is a national philanthropic organization. More than 200 delegates and local members are attending the convention, which will continue with business sessions and social entertainment until Thursday evening. 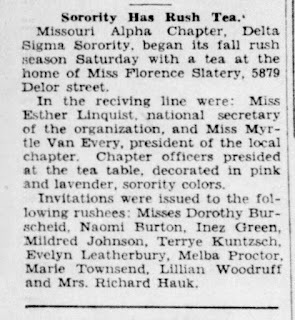 Missouri Alpha Chapter, Delta Sigma Sorority, began its fall rush season Saturday with a tea at the home of Miss Florence Slatery, 5879 Delor street. 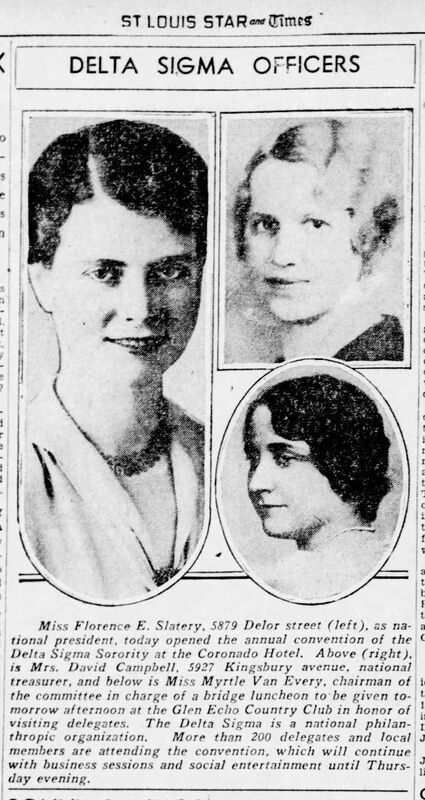 In the receiving line were: Miss Esther Linquist, national secretary of the organization, and Miss Myrtle Van Every, president of the local chapter. Chapter officers presided at the tea table, decorated in pink and lavender, sorority colors. Invitations were issue to the following rushes: Misses Dorothy Burscheid, Naomi Burton, Inez Green, Mildred Johnson, Terrye Kuntzsch, Evelyn Leatherbury, Melba Proctor, Marle Townsend, Lillian Woodruff and Mrs. Richard Hauk. 1. Both of these articles were found in the St. Louis Post-Dispatch archives There are actually four newspapers in the collection: St. Louis Post-Dispatch (1874-2016), St. Louis Star and Times (1910-1950), St. Louis News (1978), St. Louis Times (1978-1979). When the archives were first released earlier this year, the Star and Times articles weren't searchable. 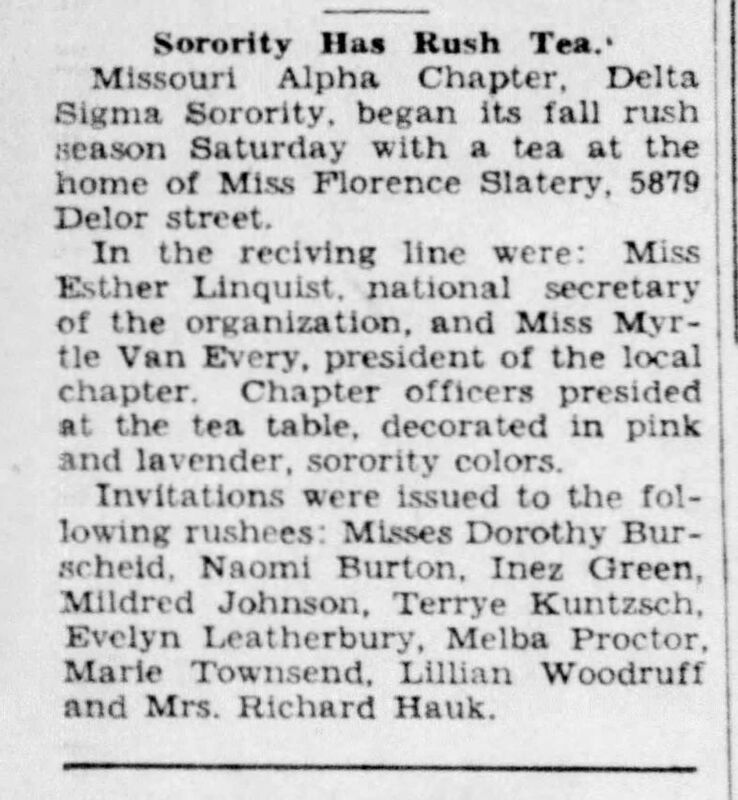 2) I'd seen references to her activity in the Delta Sigma sorority previously, but this is the first article that mentioned she was President of the local chapter. And this is also the first article that identifies Missouri as the Alpha Chapter. I have heard it repeated countless times by trustworthy genealogists that George Washington had no children. Today I found out that is untrue. After marrying Martha Dandridge Custis, he adopted two of her grandchildren from her first marriage. A child by blood is not more of a child than a child by law. If I interpret the above link - Organizations Acknowledge George Washington's Biracial Family Tree - correctly, it is new information, or at least confirmed rumor, that Washington's adopted son had children with slaves. However, it isn't new information that the adopted son had children through marriage. George Washington Parke Custis married Mary Fitzhugh in 1804, and their child, Mary Anna Randolph Custis, married Robert E Lee. Here's a chart of their descendants for three generations. I like how this comic suggests not all family stories are accurate. It's impossible to know where the cartoonist came up with the surname Van Every. He may have known someone with the surname, or have borrowed it from the famous historical novelist and Hollywood screenwriter, Dale Van Every. The character Pelion Van Every appears to have only been a part of the strip between November 1961 and February 1962. Juliet Jones is researching the history of the fictional town of Devon, and seeking descendants of co-founders Pelion and Dundee. She ultimately introduces Pelion Van Every to Dundee Greer. And, well, I don't want to spoil what happens next. Tamura Jones at Modern Software Experience has a series on Choosing Genealogy Software including Why You Need a Desktop Application as your Main Genealogy Program and Using More than One Genealogy Program. David Malki, in his webcomic, Wondermark, illustrates a conversation some of us may have had. Diane L. Richard at Upfront with NGS discusses Digital Estate Planning Laws and the genealogist.